Two men are accused of conspiring to murder Saudi Ambassador Adel Al-Jubeir. Editor's note: The FBI and the DEA have disrupted a plot involving Iran to kill the Saudi ambassador to the United States and commit other attacks, according to the U.S. Justice Department. Two men - one arrested, the other at large - have been charged in connection with the plot, which the Justice Department says was directed by elements of the Iranian government. The Justice Department says one of the men - Manssor Arbabsiar, a naturalized U.S. citizen holding an Iranian passport - arranged to hire for the assassination someone in Mexico who he thought was an associate of a drug trafficking cartel. The person in Mexico actually was a DEA confidential source who was posing as a cartel associate, the Justice Department says. Follow below for the latest developments and read the Justice Department complaint (PDF). [Updated at 8:09 p.m. ET] In their investigation into an alleged plot to kill Saudi Arabia's ambassador to the United States, federal agents interrogated suspect Manssor Arbabsiar for 12 days, a senior counterterrorism official said Tuesday. Cooperation from Mexican officials played a key role in the investigation, the official said. U.S. authorities arranged with Mexican officials for Arbabsiar to be denied entry into Mexico, the official said. From there, he was placed on an airplane to New York, where he was taken into custody and quietly taken to a U.S. government facility, the counterterrorism official said. U.S. authorities interviewed him there every day and compiled dozens of intelligence reports. [Updated at 8:04 p.m. ET] Georgia Sen. Saxby Chambliss released a statement Tuesday, congratulating the FBI, DEA and other federal agencies involved in the case. "While I believe our justice system will deal appropriately with the defendant in custody, our government must also deal with the Iranian regime," Chambliss said. "In addition to allegedly sponsoring this plot, Iran has supported and provided weapons for attacks on our soldiers in Iraq and Afghanistan. This has continued far too long with no repercussions." [Updated at 7:41 p.m. ET] Iran's UN Ambassador Mohammad Khazaee responded to U.S. accusations that the Iranian government was involved in a murder-for-hire plot Tuesday night, telling CNN's Erin Burnett that the whole thing was "a lie." “The whole issue is a provocation against Iran," Khazaee said. "We strongly reject this accusation," he said, suggesting that the narrative was a "blatant" ploy by Washington to terrorize the American public. [Updated at 7:07 p.m. ET] New York Rep. Peter King, speaking to CNN’s Erin Burnett, said the alleged Iranian plot should be taken seriously by U.S. officials. “This would have been an act of war [if carried out]. It has raised this relationship, between the United States and Iran, to a very precipitous level,” King said. “This violates all international norms, it violates all international laws. ... We can’t allow this to go without a strong reaction," King, who chairs the Homeland Security Committee," told CNN. [Updated at 6:52 p.m. ET] A spokesman for Iranian President Mahmoud Ahmadinejad said Tuesday that the alleged plot was "a child's story" and "a fabrication." The Iranian government was awaiting details about the accusations, spokesman Ali Akbar Javanfekr said. He suggested U.S. authorities were attempting to distract American citizens. "They want to take the public's mind off the serious domestic problems they're facing these days and scare them with fabricated problems outside the country," he said. [Updated at 6:40 p.m. ET] Mexican immigration officials blocked Manssor Arbabsiar, now accused of plotting to kill Saudi Arabia's ambassador to the United States, from entering Mexico last month, Mexico's foreign ministry said in a statement released Tuesday. Mexican immigration authorities blocked his entry because of an arrest warrant issued by the United States, the foreign ministry said. U.S. authorities later arrested him in New York, it said. [Updated at 5:57 p.m. ET] U.S. National Security Adviser Tom Donilon in recent weeks went to Saudi Arabia to brief Saudi King Abdullah on the terror plot, a senior administration official familiar with the terror plot said, according to CNN Chief Political Analyst Gloria Borger. The Saudis were “outraged" not only because of the plot, but because the ambassador is "someone who is close to the king,” the official said. The Obama administration has specific information tying senior officials in Iran's Quds Force - a special unit of the Iranian Islamic Revolutionary Guard Corps - the official said. One question, according to the official, is whether the Quds officials were freelancing or got approval from senior officials in the Iranian regime. [Updated at 5:37 p.m. ET] Mexico's foreign ministry, explaining why Arbabsiar was denied entry into Mexico on September 28, says Mexican immigration officials blocked him because of an arrest warrant issued by the United States. U.S. authorities arrested Arbabsiar a day later in New York, where he had flown after being denied entry into Mexico, the U.S. Justice Department has said. The Justice Department says Arbabsiar had intended to go to Mexico to guarantee final payment for an assassination of the Saudi ambassador to the United States. Arbabsiar had arranged to hire someone for the assassination that he thought was a drug cartel associate, but actually was a DEA confidential source, the Justice Department says. "In strict compliance with domestic and international law, Mexico was able to neutralize a significant risk to Mexico’s national security, while at the same time reinforcing bilateral and reciprocal cooperation with the United States," the Mexican foreign ministry said in a statement released Tuesday. "This operation confirmed that adequate mechanisms and procedures are in place to anticipate and prevent the presence in Mexico of individuals that pose a risk to national security and interests." [Updated at 5:03 p.m. ET] U.S. Secretary of State Hillary Clinton told reporters that the United States "will be consulting with our friends and partners around the world about how we can send a very strong message that this kind of action, which violates international norms, must be ended." She also said the United States would consult with nations about possibly taking measures to "further isolate (Iran) from the international community." [Updated at 4:52 p.m. ET] A preliminary hearing has been set for October 25 for Manssor Arbashiar, who is alleged in a federal complaint to be involved in a terror plot to kill the Saudi Ambassador to the United States, according to CNN's Jason Carroll. The U.S. Justice Department alleges that Arbashiar, a naturalized U.S. citizen who holds an Iranian passport, arranged to hire someone in Mexico he thought was a drug cartel associate to assassinate the Saudi ambassador to the United States. That person in Mexico actually was a DEA source posing as a cartel associate, the department says. Arbashiar, 56, was arrested on September 29 at New York's John F. Kennedy Airport, where he flew to after being denied entry into Mexico a day earlier, the Justice Department says. The department says Arbashiar had intended to go to Mexico to guarantee final payment for the assassination. The Justice Department alleges that the second man who has been charged - Gholam Shakuri, who the department says is an Iran-based member of Iran's Quds Force - and other co-conspirators were aware of and approved of the plan. Shakuri is at large, the department says. With Shakuri's approval, Arbashiar arranged to wire about $100,000 to a U.S. bank account for the DEA source as a down payment for the assassination, according to the Justice Department. The total price was set at $1.5 million, according to the department. According to the Justice Department, Arbashiar and the DEA source discussed carrying out the assassination with explosives, possibly by bombing a U.S. restaurant that the Saudi ambassador frequented. When the source told Arbashiar that others - including U.S. senators that visit the restaurant - could be killed, Arbashiar allegedly dismissed those concerns as "no big deal," the department says. [Updated at 4:42 p.m. ET] The chairman of the U.S. House Permanent Select Committee on Intelligence, Mike Rogers, released a statement condemning the alleged plot. "The Royal Embassy of Saudi Arabia would like to express its appreciation to the responsible agencies of the United States government for preventing a criminal act from taking place. The attempted plot is a despicable violation of international norms, standards and conventions and is not in accord with the principles of humanity." [Updated at 3:52 p.m. ET] Ali Akbar Javanfekr, a spokesman for Iranian President Mahmoud Ahmadinejad, told CNN he had never heard of those accused in connection with the alleged plot. Javanfekr says if the Iranian government verifies that these individuals are Iranian citizens, the Iranian government will make every effort to help them. [Updated at 3:44 p.m. ET] A senior defense official said there has been no change to U.S. military posture in reaction to the terror plot allegedly backed by Iran. The official says American Navy ships in the region have not been re-positioned, and at this point there are no plans to do so. “The act is already done. One of the people involved is still at large, but the other principal is in custody. So what does changing military posture do?" the official said. The official was not surprised at the level of cooperation apparently given by the Mexican government to foil the terror plot. [Updated at 3:42 p.m. ET] Senior U.S. officials tell CNN that the U.S. will impose further sanctions against Iran in the wake of the alleged foiled terror plot. [Updated at 3:36 p.m. ET] Former U.S. Ambassador to Saudi Arabia Robert Jordan told CNN that he believes the current ambassador would be a target for Iran because he is a man who can "be counted on to be a collaborative and positive force between the United States and Saudi Arabia." "It is also an attack on the United States to attack this ambassador," Jordan said, because of the ambassador's relationship with the United States. Jordan, who said he is a close friend of Saudi Ambassador Adel Al-Jubeir, said he has impeccable credentials and is a consummate diplomat." "Its very important to understand that the Saudis and the Iranians believe that they are in a mortal battle for supremacy in the Middle East," he told CNN. "The Saudis view Iran as a threat to their hegemony in the Arab world and Iran has been insinuating itself into many of the struggles in the Middle East that is in the contrary to the Saudi national interest." It is because of the ambassador's position as well as the struggle in the region that Jordan believes he may have been a target. "I think he is a target [that] there is credibility to this story," he said. "The Saudis have viewed Iran as a threat." In the spring of 2011 through October 2011, Manssor Arbabsiar and his Iran-based co-conspirators, including Gholam Shakuri of the Quds Force, began plotting the murder of the Saudi Ambassador to the United States. At one point Arbabsiar "allegedly met on a number of occasions in Mexico with a DEA confidential source who has posed as an associate of a violent international drug trafficking cartel," according to the Justice Department. [Updated at 3:06 p.m. ET] A senior Obama official said the administration won't tolerate the targeting of a diplomat on U.S. shores, CNN Chief White House Correspondent Jessica Yellin reported. The official said the administration believes the alleged plot is a dangerous escalation by Iran and a flagrant violation of international law. The official said the U.S. will work with other international partners to isolate the government, specifically the Islamic Revolutionary Guard and the Quds force. The official said overall, the impact of the plot, means that the U.S. will continue to isolate Iran. The official added that the administration has been talking and coordinating with Saudis and remains in close touch with the Saudi government. They have also been in touch with the ambassador at the center of the plot. [Updated at 2:55 p.m. ET] CNN's Peter Bergen said that based on his knowledge of the region the Saudi ambassador to the United States may have been targeted because he is a key foreign policy adviser to Saudi King Abdullah. [Updated at 2:35 p.m. ET] Attorney General Eric Holder, when asked how Iran would be held "accountable" in an alleged plot to assassinate the Saudi ambassador to the United States, said he expected action from the White House, the State Department and Treasury within the next few hours. A U.S. official expanded more about how the U.S. might hold Iran accountable. The official told CNN's Elise Labott that there are likely to be more sanctions and the U.S. will be taking this up with to the United Nations Security Council and other members of the international community. [Updated at 2:32 p.m. ET] One of the suspects, Manssor Arbabsiar, allegedly discussed bombing a restaurant in the United States that the Ambassador frequented, according to the complaint. The U.S. attorney for the Southern District of New York said Tuesday there had been a "discussion of using explosive devices" to carry out the alleged Iranian-linked terror plot against the Saudi ambassador to the United States. [Updated at 2:25 p.m. ET] The U.S. Attorney for the Southern District of New York called the alleged Iranian-linked terror plot against the Saudi ambassador to the United States "well-funded and pernicious." "Details of that murder plot are chilling," Preet Bharara said in a news conference Tuesday. [Updated at 2:22 p.m. ET] The criminal complaint filed Tuesday in the Southern District of New York names Manssor Arbabsiar, a 56-year-old naturalized U.S. citizen holding both Iranian and U.S. passports, and Gholam Shakuri, an Iran-based member of Iran’s Quds Force, which is a special operations unit of the Iranian Islamic Revolutionary Guard Corps (IRGC) that is said to sponsor and promote terrorist activities abroad, according to the Justice Department. 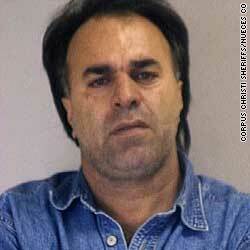 Arbabsiar was arrested on September 29, 2011, at John F. Kennedy International Airport in New York. He will make his initial appearance on Tuesday before in federal court in Manhattan, the Justice Department said. He allegedly confessed to his participation in the murder plot, according to the Justice Department. The men are charged with the following crimes according to the Justice Department: "conspiracy to murder a foreign official; conspiracy to engage in foreign travel and use of interstate and foreign commerce facilities in the commission of murder-for-hire; conspiracy to use a weapon of mass destruction (explosives); and conspiracy to commit an act of international terrorism transcending national boundaries. Arbabsiar is further charged with an additional count of foreign travel and use of interstate and foreign commerce facilities in the commission of murder-for-hire." [Updated at 2:19 p.m. ET] FBI Director Robert Mueller said the alleged terror plot involving Iran "reads like the pages of a Hollywood script." "This case illustrates that we live in a world where borders and boundaries are increasingly irrelevant," Mueller said. [Updated at 2:14 p.m. ET] An alleged plot - involving Iran - to commit terrorism inside the United States "is a fabrication," Ali Akbar Javanfekr, spokesman for Iranian President Mahmoud Ahmadinejad, said Tuesday. Javanfekr said the Iranian government is awaiting details, but suggested U.S. authorities are attempting to distract American citizens from "domestic problems" by convincing them there is an outside threat. [Updated at 2:12 p.m. ET] An FBI agent's affidavit obtained by CNN Tuesday accused two men of conspiring to murder Saudi Ambassador Adel Al-Jubeir. The complaint alleges that Manssor Arbabsiar and Gholam Shakuri began a plot this past spring to kill Al-Jubeir. Attorney General Eric Holder said in a news conference that the terror plot was a $1.5 million dollar "murder-for-hire" plan. Officials also said one of the suspects told an informant that killing civilians, including senators, during the attack was "no problem" and "no big deal." [Posted at 2:00 p.m. ET] The FBI and the DEA have disrupted a plot involving Iran to commit terrorism inside the United States, a senior U.S. official told CNN. The official said the alleged plan was directed by elements of the Iranian government and involved a plot to kill the Saudi ambassador to the United States. Filed under: Iran • Saudi Arabia • Terrorism • U.S.
“You guys know this is absolute bullsht right? The Saudis made it very clear that blocking the PA bid at the UN would alter the relations between the US and Saudi Arabia, as well as the rest of the Arab world. "The United States must support the Palestinia­n bid for statehood at the United Nations this month or risk losing the little credibilit­y it has in the Arab world. If it does not, American influence will decline further, Israeli security will be undermined and Iran will be empowered, increasing the chances of another war in the region. Moreover, Saudi Arabia would no longer be able to cooperate with America in the same way it historical­ly has. With most of the Arab world in upheaval, the “special relationsh­ip” between Saudi Arabia and the United States would increasing­ly be seen as toxic by the vast majority of Arabs and Muslims, who demand justice for the Palestinia­n people. Saudi leaders would be forced by domestic and regional pressures to adopt a far more independen­t and assertive foreign policy." This strikes me as something U.S is doing to inflame the already bad relationship between the Kingdom and Ahmedinajat... but if there is a solid evidence, this is embarassing. Of course the plot read like a Hollywood script. It's strange that the DOJ gets in a mess dealing guns to the drug cartels, then all of a sudden a cartel member comes forward with this plot info. You can count on it, Iran is in the cross hairs. It less than 6 months the S hits the fan. so all you conspirists would rather believe a leader who thinks the holocaust is a hoax over the U.S. government? interesting. Maybe youre right, our country is going down the drain...thanks to people like you. The Koch brother were helping to fund terrorism by breaking the law and making millions with secret Iran Sales. They contribute to Bachmann's campaign. I also remember reading that Sen. McConnell attended Koch brothers get away weekend and has received contributions from them. Why am I not surprised that the party of NO is benefitting from traitors such as the Koch brothers. How is this a `terror' plot?? It is an assassination plot, intended to murder one individual, for motives that have absolutely nothing to do with instilling fear in the general population. This is not a case of Iranians plotting terror on US soil, and to present it as such, is dishonest and inflammatory. We are all well aware that the US is looking for any reason it can find to justify military action against Iran. However, the murder plot of a few individuals against another is surely not grounds for international military action. If this plot does amount to `terrorism' surely the US is guilty of the same for their assassination of Bin Laden over international boundaries. Bin Laden was not a diplomat. How is blowing up a restaurant not a terror plot? Are you retarded? They are plotting to bomb a restaurant on US soil which could have hundreds of patrons in it. How is that not terrorism? im an American..a Muslim...a Sunni...but in my opinion...F the Iranians...F the Saudi Oil Sheiks and most of all F ISRAEL!!!! im an american, christian white male. Amen to that. This country is awesome, because of the people that inhabit it. Not because of our government. Isolate ourselves from the problems of the middle east and focus on our own problems. We dont need Isreals problems or their money. They made their bed 60 years ago, let them sleep in it. You just ahd a man named Reza on your show. He insinuated that the Iranian plot to blow up the Saudi & Isrealiembassies is not true. Is this your position? If not, you need to come out & say so. Those cars refused to stop at two check points. Turns out they were carrying weapons and bomb making materials. Here we go, get ready for an Israeli military strike in Iran. Fear that Muslims would band together now in doubt with fake assassination attempt claims. Another Coinintelpro style operation to turn sides against each other in the wake of Israel pending action. When will we Americans stand up and demand our government stops interfering in matters that don't concern us? It amuses me to no end how these people criticize the US, oblivious to the fact they are up to their elbows in every thing we do. In another story, the US helped saved the 3 billy goats gruff and got them safely over the bridge by thwarting the trolls plan to eat them. what upsets me most is this cat and mouse game between the U.S and Iran...The world knows very well that Iran is ruled by a clan similar to the one in Syria 2 different mafias 2 different countries, its very obvious that the Irani people are also suffering from this brutal regime m why not make a change with out war and blood shed, just get rid of this crappy leadership which is ill minded and sick in every sense of the word, does any one doubt America's ability to do so? I dont but it seems they dont want to, for reasons that are at this point, kept secret.